We have a minimum order of $25.00 for internet and phone orders at this time. 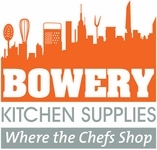 So Check out our many items offered below and dont hesitate to email us any special requests to Bowerykitchen@mac.com. Pots and Pans of every style and material! From cocktail shakers, to corkscrews, jiggers, bitters, wine openers, ice cubes and more all for the bar right here! Custom-Made Stainless Steel Worktables ,Counters and Furniture. Butcher Block Tables, Pot Racks , Wire Storage Shelving & More. Sinks, Dishwashers, Mops, Buckets & More.